Marijuana could be America’s answer to the opioid crisis | A Healing of the Nation. April 10, 2018 – San Diego, CA. It’s a classic phrase often heard from music icon Bob Marley when he said “It’s the healing of the Nation”, when he openly talked about the use of marijuana. Bob was a strong vocal advocate of the use of marijuana for the many clinical and medical benefits of the plant. Today the phrase should be taken at face value since now America is deep into the opioid crisis. Daily headlines assault us with news stories of the amount of people dying in this pain killer epidemic. The CDC reported that opioid overdoes killed 20,000 in 2016. Each day, 90 Americans die from opioid overdoses. This epidemic didn’t just happen overnight; we’ve been on the road to addiction for some time now. How did we get into this Opioid Crisis? The quick answer is shocking. The big pharmaceutical companies played down the addictive nature of their powerful pain killing products, and they spent multi-millions of dollars advertising them to our doctors. How does this work? “Big Pharma” as we like to collectively call them, has a known track record spending more money marketing to doctors than on drug research. Pharmaceutical companies pay doctors in the form of meals, speaking gigs, literature, travel and more, and have been doing so for years. But let’s not lay all the blame on Big Phama. We need to also look at the secondary supply chain, the illicit black market for drugs. Drug cartels the world over are both highly profitable and able to act quickly to market demands. Once the opioid legal “pill pushing” stated in the 1990’s by doctors and hospitals, drug cartels and dealers felt the pinch of loosing sales. What happens when any company starts seeing sales and profits drop? You create more demand for your product by lowering the price, and this is exactly what happened to the price of heroin and the much more potent fentanyl. Prices drop drastically on heroin and fentanyl and helps fuels the epidemic. We looked at data from The United Nations Office on Drugs and Crime and found that the average retail price of a gram of heroin in the 1990s was close to $300.00. Over the next two decades the price point dropped to less than $150.00 per gram. In 2007 the lowest retail price was $131.00. The data illustrates an increasingly competitive retail market. The U.S. DEA has mentioned that a kilo of heroin can be bought for about $6,000 and sold for upwards of $80,000 wholesale before reaching a few hundred thousand dollars on the street. The same pattern happened with fentanyl. The steady rise of illicit fentanyl began to appear in the 1980s according to Michael Evan’s-Brown of the European Monitoring Centre for Drugs and Drug Addiction in Lisbon. Pharmaceutical companies began to develop different variants of fentanyl and today there are over 30 types (only 19 are controlled substances under federal law). Fentanyl can be 50-100 times stronger than morphine. A single gram can make tens of thousands of doses. This fact alone makes it easy to see why fentanyl is gaining momentum in both dealers and users, small quantities make it easy to transport and hide. Recent reports from Canada showed fentanyl was being shipped from China in silica-desiccant packets with urine-test kits. It’s also highly profitable with dealers making hundreds of thousands and even millions from “cutting” the drug. What is our government doing about the opioid epidemic? Currently we have seen a trend of individual States and county law enforcement agencies seeking to sue both manufactures and distributors of pain pills. Our Federal government is also taking actions; however what’s being submitted by the Fed’s may not be enough. The Surgeon General, Dr. Jerome Adams, made a statement recently that everyone should carry naloxone, an anti-overdose drug if they know someone at risk. The National Institutes of Health made public it’s close to doubling its budget for opioid addiction research. Scott Gottlieb, the commissioner of the Food and Drug Administration said his agency would do more to stop the import of illicit opioids. 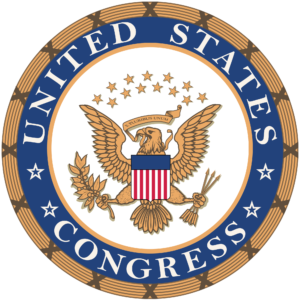 There is currently a bill before Congress to help give states that treat and rehabilitate people facing opioid addiction. The NIH said it would double its research budget for opioid abuse from $600 million to $1.1 billion to focus on safer alternatives to treat pain. All words and little action – same old thing by our government? New Studies show Marijuana is weakening the Opioid Crisis. We are currently living in very interesting times when it comes to how people view marijuana. We now have states that have legalized marijuana consumption for both medical and recreation use. In 1995 a Gallup survey on public marijuana views showed that just a quarter of respondents wanted to see marijuana legalized. A new study by the independent Quinnipiac University found 94% support the idea of legalized weed in August 2017. Today 30 states have legalized cannabis in some form since 1996. 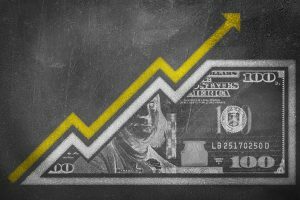 Cannabis research firm ArcView estimates that legal marijuana sales could average 28% growth per year to 2021. Cannabis is still a Schedule I Drug – An outdated and misleading classification. Marijuana is still federally listed as a Schedule I drug. It has been from its initial listing back in the 1970s. Schedule I drugs include narcotics like heroin, LSD, ecstasy, methaqualone, peyote and cocaine. Schedule I drugs (according to the Feds) have no medical use, and have a high abuse potential. Until this is changed on the federal level, states can ultimately be held responsible. Drugs can be rescheduled by petitioning the DEA but the agency has ignored repeated petitions to remove marijuana from Schedule I for decades. Not only has marijuana been proven to alleviate many maladies from grand mal seizures in children to helping cancer patients recover faster, but it’s also helpful for some pain management. But despite all of the scientific research, Attorney General Jeff Sessions has made it clear that he’s not in favor of marijuana legalization. In January 2018 the Trump administration de-railed the Obama-era policy that kept federal authorities from cracking down on the pot trade in states where the drug is legal. Many states are now left in a state of confusion on what they can and can’t do under these federal guidelines. The good news is that many states are simply turning a blind eye to the feds and proceeding to offer medical and recreational solutions to its populous. Are Cannabis products a good alternative to opioid pain killers? Yes they are! 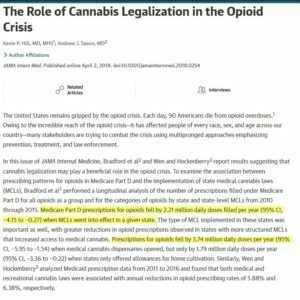 New research performed by JAMA Internal Medicine on April2, 2018 said “results suggesting that cannabis legalization may play a beneficial role in the opioid crisis”. In a study based at the University of Georgia, researchers looked at Medicare Part D prescriptions for people over the age of 65 between 2010 and 2015. The study illustrated that opioid daily dose per year decreased by 2.11 million doses per year from an average of 23.08 million daily doses per year, when a state instituted any level of medical cannabis law. Cannabis plants contain hundreds of chemical compounds that together create many beneficial effects. Cannabinoids such as TCH and CDB are the most widely known and discussed. -TCH (Δ9- tetrahydrocannabinol) can stimulate hunger and make the “high” feeling. It’s commonly used for pain and nausea. -CBD (cannabidiol) is a non-intoxicating compound that can help alleviate anxiety, pain, inflammation and other medical ailments. Today the marijuana industry is getting ready to explode bringing with it, tremendous new revenue streams via state taxes, and highly beneficial stress and pain relief. Maybe now is the time to embrace with wise words of Bob Marley and fully legalize marijuana – because it really could be “The Healing of the Nation”.